Thai pink egg tomato patch after about three minutes with the scuffle hoe. Back on June 30, 2006, a month and a half after declaring myself to be Baby Cary's mother, I declared my love for the scuffle hoe in this post: How To Use a Scuffle Hoe to Weed the Vegetable Garden - and Why I Love Mine So Much. It was far from love at first sight for me and my scuffle hoe, but the hard won feelings of affection have endured, and after all these years, I'm still enamored with it. This little old garden tool isn't put into service that often (mostly because the weeds in my garden seem to go from two inches high to two feet high in about an hour), but it always does its one job well. Do you use a scuffle hoe? Any tips, techniques, or amusing stories to tell? 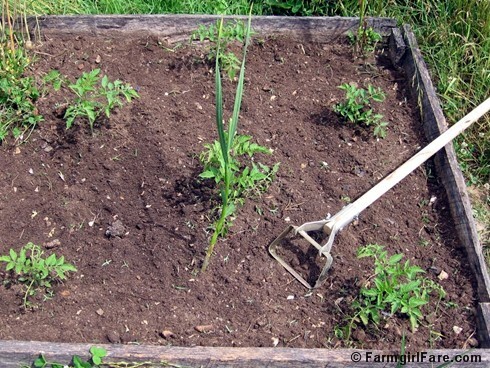 © FarmgirlFare.com, where we're very big on mulching but are still always needing to do some weeding. Love garlic? Learn How To Grow Your Own Garlic here (it's easy!). And you'll find links to my favorite recipes that call for garlic at the end of this post, along with links to other garlic growing posts. Freshly harvested green garlic (on the mature side) that's been cleaned, trimmed, and is ready for cooking. Garlic is a lot hardier than I thought. Green garlic, also known as spring garlic, young garlic, baby garlic, and garlic shoots, is simply an immature garlic plant. It's milder and sweeter than mature garlic, with a wonderful flavor. I discovered green garlic back in 2006 and wrote about it in this post: What Is Spring Green Garlic? Growing It, Cooking with It, Loving It, plus a Recipe for Easy Green Garlic Fettuccine. The green garlic pictured above is on the mature side. I've never seen green garlic for sale here in rural Missouri, but in photos I've seen of green garlic, such as this one and this one, the bulbs haven't started forming, and it bears a closer resemblance to scallions or baby leeks. It's edible at any stage. Green garlic season starts as early as February in places with mild winters, like the San Francisco Bay Area, and has come and gone here in Missouri, but green garlic must still be available in some places because my spring green garlic post is still showing up as one of the ten most popular posts on In My Kitchen Garden this week. (The weekly top ten posts are listed in the left sidebar of every In My Kitchen Garden page). 6/24/11 Update: Today's weekly e-mail newsletter from the Center for Urban Education about Sustainable Agriculture (CUESA) reports that the green garlic season is 'winding down' at the San Francisco Ferry Plaza Farmers Market. Look for green garlic at farmers' markets, in your CSA subscription box, or try growing some yourself. Like with onions, you can grow green garlic in zero extra garden space by double planting your garlic and then thinning it out by harvesting half of it when it's young. I accidentally missed green garlic season this year. Early last fall, volunteer garlic plants began sprouting up in the bed where I'd harvested the 2010 garlic a few months earlier because I'd left some of it in the ground while digging. Sometimes it pays to be sloppy. More info and photos below. . .